White Pines cabin is accessible by road and its setting includes a large picnic area with a pond and enlarged campfire ring seating ideal for groups. The cabin has two stories: the first story contains the kitchen, bathroom and living room and one bedroom, and the second floor has one bedroom. 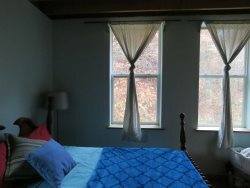 White Pines cabin can sleep 6: There is a full size bed in the 1st floor bedroom; two single beds in the upstairs bedroom; and a full size futon in the living room that can sleep 2. White Pines cabin is located alongside Route 77 (Nada Tunnel Rd.) in the Red River Gorge geological area, and is a perfect fit for a large group, a family, or one to two couples. Enjoy relaxing in the heart of the Red River Gorge and step right out the door onto miles of trails with spectacular rock features and views. White Pines cabin has immediate access to Trail #221, the Rough Trail, from the Martin’s Fork parking lot, just 300 yards up the road. Staying in a Red River Gorgeous Cabin is truly a one-of-a-kind experience. Since all of our hand-built cabins are unique, we wish to inform you of their individual features so you can come prepared to enjoy your stay to the fullest. Kitchen: Complete kitchen furnished with an electric glass-top stove, oven, full refrigerator, double sink, and microwave. Cookware, dishware, soap and cleaning linens are also provided. Living/Dining: White Pines has a large kitchen table that seats 6. The adjacent living room is a welcoming space complete with a futon, couch, small desk and several chairs. Bathroom: Full bath with sink, toilet and shower. Bedroom: The downstairs master bedroom has a queen bed. Upstairs in the loft are two twin beds and a full-size memory foam. Additionally, there is a couch and full-size futon in the living room. Pillows are provided. Additional Amenities: Weber charcoal grill, two AC units, wall heater, covered porch with furniture, TV (DVD only) and private fire pit. Firewood is also available upon request. For $20 we will deliver firewood to your fire pit. Please be sure to mark on your reservation if you would like firewood delivery. Please be sure to put out all fires COMPLETELY when you are finished.